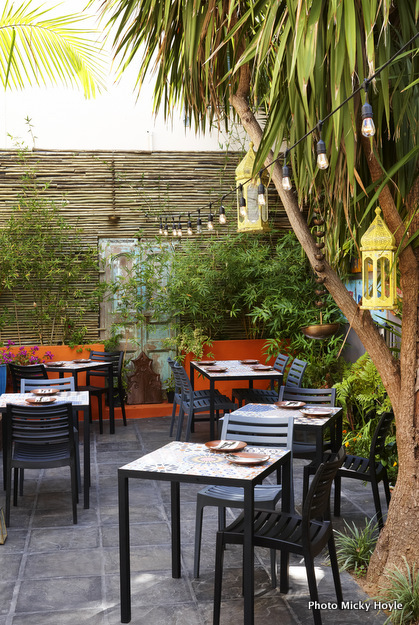 Consisting of a series of linked interior spaces and a back courtyard of a double-storey historical house, Thali is crammed between narrow shops and a popular bar on an inner city Cape Town street. It’s a busy street, well worth a taxi ride to experience the Indian tapas and interior décor inside. The restaurant and bar’s patterned walls and a blue-and-white tiled staircase lead up to Sally Chapman’s wallpaper of hand-sketched birds on the landing, near a hanging group of cages. In time, a first-floor dining space in vivid pinks named The Birdcage will host small groups for Indian feasts. Thali’s interiors are rich and varied but refreshingly there is no “placed” décor from interior professionals. Treasured Indian postcards and other auction finds co-exist with old marble fireplaces and modern mosaic dining tables. Thali’s restaurateur business partners collaborated on the décor as much as on the food. The black-tiled kitchen opens to the dining room with decorative wooden rolling pins and spoons, and a long blue velvet banquette. Beyond it, the dining space extends to an Indian courtyard garden — also designed by Chapman — brightened by lanterns, an ornate chest and bamboo on walls. It is an appealing spot to enjoy fresh oysters with a carrot juice-infused Cape Malay dressing on a summer evening. Although you may think of tapas as ordering a series of plates of your choice, at Thali the kitchen determines most of your menu. Oxford Dictionary defines a thali as a metal plate on which Indian food is served, or a type of set meal at an Indian restaurant. Both descriptions fit the Cape Town version: two diners each eat four tapas dishes, with a few alternatives here and there. 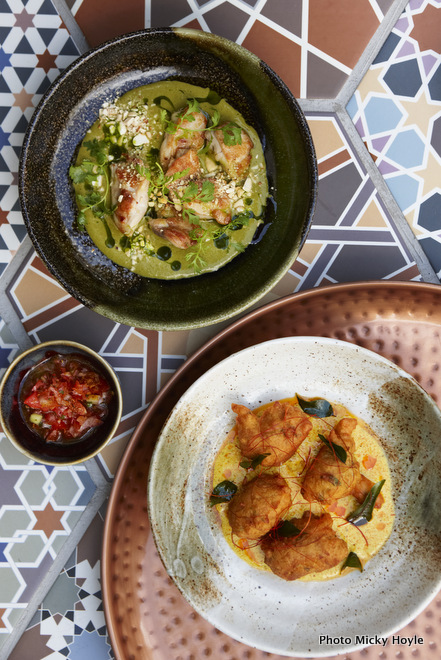 The restaurant’s modern style delivers skill, texture and crunch in beautiful food with “Indianised” flavours. 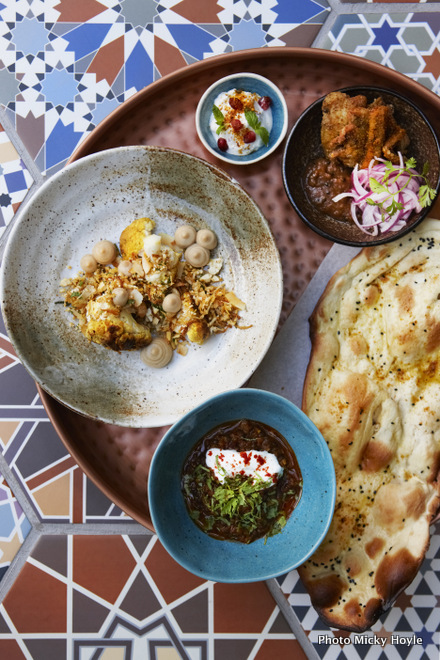 The kitchen sends it on earthenware plates, wooden bowls on metallic trays, and a smoking copper tandoor vessel. Dublin-born chef Liam Tomlin is the culinary kingpin behind Thali. Before Cape Town, he and British wife Jan operated Australia’s Banc, awarded restaurant of the year in 2001 in the Sydney Morning Herald Good Food Guide. When they opened Chefs Warehouse & Canteen in Bree Street in 2014, the couple merged the sociability of tapas with fine dining precision and casual benches. Opening Thali in November 2016, the Tomlins partnered with friends Dimo and Candice Papachristodoulou of The Fat Cactus and Long Street Café. 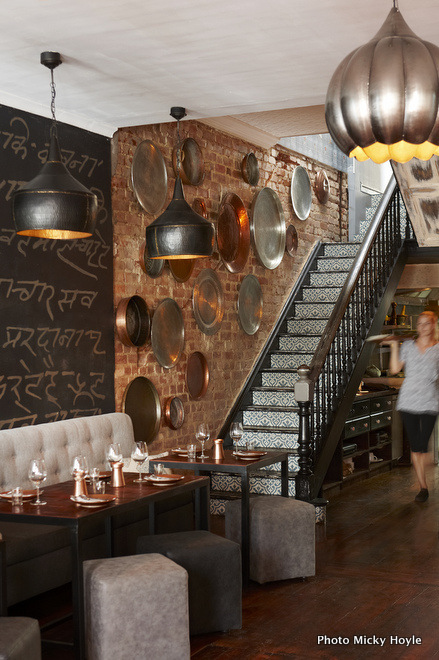 Former Chefs Warehouse recruit John van Zyl heads Thali’s kitchen. Van Zyl worked with Tomlin for four years previously, and recently assisted chef Angelo Scirocco in opening Urbanologi in Johannesburg. Meat and vegetarian options both start with a cleverly crunchy potato and chickpea chaat snack with pomegranates. Three more courses follow the chaat in stages. Also staggered: chilli jam, yoghurt raita, fragrant rice, naan bread and flaky paratha. So you could have lighter grilled meats such as minced lamb kebabs, steamed fish with tangy dressing or tamarind-spiced pork belly next. Heavier chicken or lamb curries follow. White wines here are on the more aromatic side. The vegetarian menu includes black dahl, or tandoori and pureed cauliflower variations served with coconut and cashew. Homemade paneer cheese in spiced spinach, curry emulsions or vegetable curries complete the repertoire. “The concept is that it’s light and bright flavours,” says Van Zyl. A lemon posset dessert signature is tough to beat. Thali’s variation infuses cardamom in double cream, plus rose syrup, pomegranates and crushed pistachio. THALI, 3 Park Road, Gardens. Thali for one (R180) lunch Mon to Fri. Tapas for two (R650) dinner Mon to Sat. No reservations. Tel 021-286-2110.